Providing tools and guides to for scholarly bibliographic searches. For nearly any topic or course section, one course assignment can be to explore a topic further by doing bibliographic searches and constructing a focused bibliography. This is also an important element in developing a research paper. 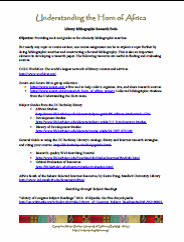 The following resources are useful in finding and evaluating sources. Read here or download the PDF. https://www.zotero.org/ A free tool to help collect, organize, cite, and share research sources. https://www.zotero.org/groups/ucb_horn_of_africa_project. Collected bibliographic citations from the Understanding the Horn team. “Library of Congress Subject Headings.” 2013. Wikipedia, the Free Encyclopedia. Alves, Julio. 2013. “Unintentional Knowledge.” The Chronicle of Higher Education, June 23. http://chronicle.com/article/Unintentional-Knowledge/139891/.